They say that the first Month is the most challenging. The most exciting but the most challenging . You get used to the fact that you don’t have a house and a room “back home” to go to when you get tired, instead you curl up on your lumpy bungalow mattress and just get on with it. You stutter and stumble when someone asks you where your from and what your job is (uh.. Im a writer? More like a professional homeless person). The first month is also when the excitement is most real. You have so many times when you realise you’re actually doing it! 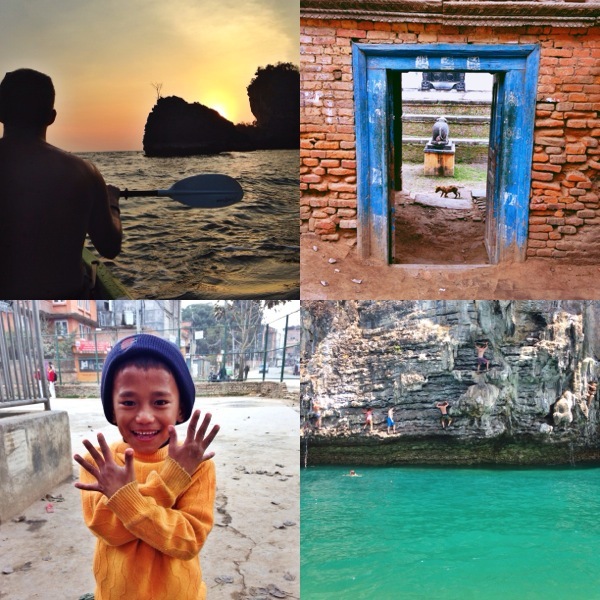 Our first month took us from Malaysia, Southern Thailand and has left us in Nepal.I really felt that we got a great overview of Southern-Thailand and we both had an amazing time. 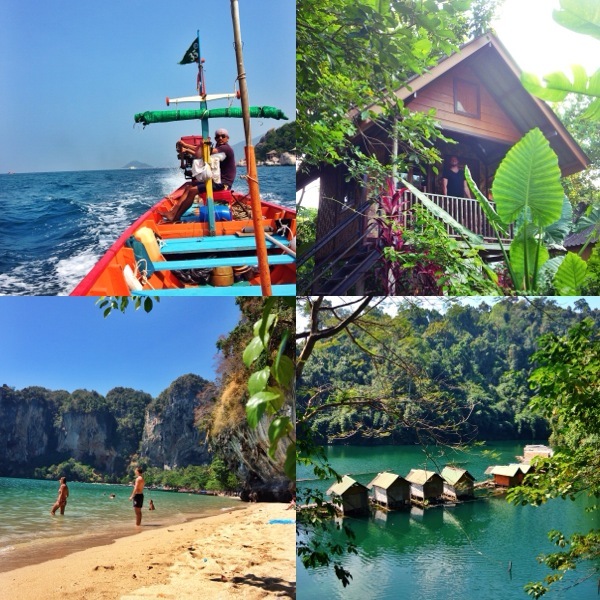 From the reefs of Koh Tao to the Jungles of Khao Sok and the beaches of Railay. – Getting on the bus at the LCCT in Kuala Lumpur after our flight from Australia. Not exactly a thrilling activity but for me this was the moment that it really hit me that we were actually doing it! – A delicious breakfast of Roti Canai and TehTahrik on our first morning in Malaysia. We literally just saw a line of people and a small food stall and just winged it. I was probably the best breakfast we had the whole month. – Our night in the second class sleeper train on our way to Thailand. There is something so exciting about sleeping on a train! – Every time we ate at Su Chilli’s on Koh Tao. I can’t express how amazing the food was. It was the highlight of our time in Koh Tao. The Pad Thai was so tasty with lots of peanuts, big pieces of chicken and tofu and a dash of lime. Im drooling just remembering the nutty, spicy flavour. – Diving the clear blue water around Mango Bay on Koh Tao. We spent hours in the water diving down with all the fish. It was like being in our own little world. – Chris seeing his first shark in the wild. We managed to see two little black-tipped reef sharks in Sae Daeng Bay in Koh Tao and we even got them on video. They are just so beautiful to watch (I can’t believe Australia is killing these magnificent creatures). – Getting down to 20 meters on a single breath of air when we learnt to free dive on Koh Tao. I never thought I could do something like that and it was exhilarating and empowering. -Spending a night in a “fancy hotel” in Surat Thani. Think comfy bed, hot shower, white sheets and breakfast in bed. After two weeks living in a very basic bungalow in Koh Tao, this was heaven. – Hiking through Nam Talu Cave and swimming in the warm jungle lake of Khao Sok National Park. There is nothing quite like swimming in warm lake in the middle of a beautiful jungle. – Making friends on a day doing Deep Water Soloing in Tonsai, Railay. We sucked at the rock climbing part but it was great fun watching other people climb and chatting with the people on our boat. – Going a little crazy at H&M in Kuala Lumpur. I love H&M! – The bus ride from hell. Lets just say that I thought we were going to die, I cried, we got off the bus and in the end it all worked out. I learnt a valuable lesson, if you’re scared and you think your life is in danger, get off the bus. Its not worth it! – The overall touristy, douchness of Koh Tao was a little disappointing. We did stay directly in Sairee beach so this could have been avoided of we had stayed in a more remote location. The whole island is outfitted for the needs of tourists and it just wasn’t authentic in the slightest. At times it felt like a theme park for young, drunk tourists from around the world. – Getting mad at Japanese tourists in Mango Bay on Koh Tao who thought it was a fun game to feed the fish and then catch them in small plastic bags. They then proceeded to throw the fish around. One fish actually ended up getting thrown onto sharp rocks. I am the least confrontational person but I ended up getting so angry that I took all the plastic bags off the tourists. Don’t worry I saved all the fish and they are hopefully swimming happily in Mango Bay as we speak. – Every breakfast in Thailand. Thai people just don’t get breakfasts. They just don’t. – The worst Pad Thai ever at the Jungle Huts in Khao Sok. Soggy pink noodles with strips of carrot and cabbage. EW. – The lumpiest mattress in all the world in Tonsai, Railay. It was like sleeping on a small, bumpy hillside. 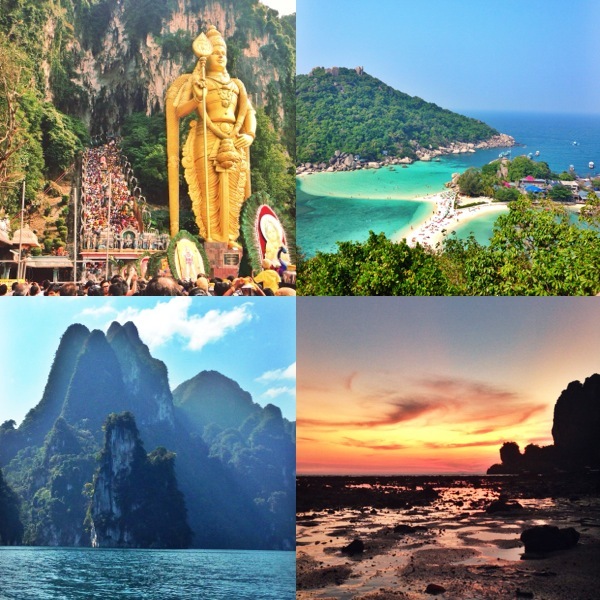 – Getting food poisoning in Krabi. Still not sure what caused this horrible onset of food poisoning but it was awful. Thankfully we were checked into a nice hotel with air conditioning and a clean western toilet, so this made the experience less awful. But throwing up eleven times in 12 hours was horrendous. Chris did do a great job of looking after me though! – Discovering my passport had gotten wet and the picture was barely visible. Post about this soon but I will let you know that it all worked out in the end. The next month will we spent in Kathmandu, Nepal. We have been here for four days already and I love it. Its very cold at the moment so I am siting all rugged up writing this. The next month also brings about our foray into trekking. It so great to stop for awhile and unpack the bags. We are staying with my sister in her cute apartment and I more relaxed than I have been in a long time. Thanks for following our journey with us! How has your last month been? Leave us a comment or email us at dirtypawsblog@gmail.com.